IP 43, the gun confiscation ballot measure is dead. Today the courts released their response to our challenge to the ballot title and agreed that the language in the title was misleading. The court took note of this rhetorical sleight of hand and also pointed out that the term “large capacity magazine” (also banned under this measure) had no real meaning, given that the standard capacity magazines for many firearms could be anywhere from 14 to 30 rounds. So to say anything over 10 rounds is “large capacity” is misleading at best. It is a sad testimony that the people who were hoping to imprison their fellow Oregonians for exercising a God given right are charading as “people of faith.” The fact that one of them is a “rabbi” is even more astonishing knowing what happened to people of his religion after the Nazi’s implemented the very schemes he hoped to make law. 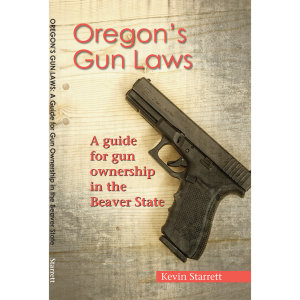 The 43 promoters made it clear that they were counting on duping the young and ignorant and expoliting the wave of anti-gun hysteria created by a complicit media to convince Oregonians to voluntarily give up their rights. As with the promoters of IP 44, they failed. While they most certainly will be back, (hate never rests) this was a profound victory. We want to thank everyone who was part of this battle and supported our work to stop these attacks. You have been very generous and we are deeply grateful. We also want to say a special thanks to our legal team who worked tirelessly to expose the truth behind these measures. But given the billionaires who fund the gun grabbers we know there will be no shortage of attacks in the future. You can help to keep us strong by supporting our efforts here.